The tough retail environment, reflected in Macy's second-quarter posted loss and a somber US government outlook for retail, may actually be good news for shoppers. We'll learn (as my mother said about her depression years) how to be wise buyers. 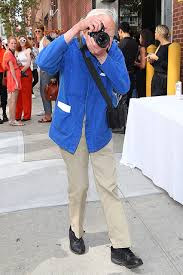 As Cathy Horyn observed, in an interesting piece on the revival of Liz Claiborne, "Can Liz Claiborne Get Its Groove Back? ", "Today the goal for many is to be smart- smart with money, smart with time, smart about how you look." Doesn't that just sound like an enduring, even noble wish? The key in a down time is not resorting to such obdurate basics that you look outdated even in the few new clothes you buy. The cost-pe r-wear formula has led me down many a pricey path, but now, some things are just too high-end even if I swear I'll wear them till the dawn of the next ice age. Each woman will define what "smart" is for her. 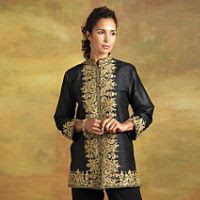 For me, an embroidered silk Kashmiri jacket (on sale for $120) from the National Geographic Store could make the cut, a bargain if the fit is right. For outerwear, I like this A.P.C. double-breasted pea coat in mood-elevator marigold, ($390 at net-a-porter). I would depart from my habitual black for a Tracy Reese Runway pleated skirt in in a nearly year-round fabric (about half cotton and nylon, with some spandex) in Storm, a slightly blued grey, $320 (at eluxury). All classics, but with something extra to elevate the eye and spirit. If we're going to wear our clothes longer and more frequently, we have to love them madly. Today's NYT Style section contains Horyn's own choices for recession buying, "Tiptoeing into the Stores". 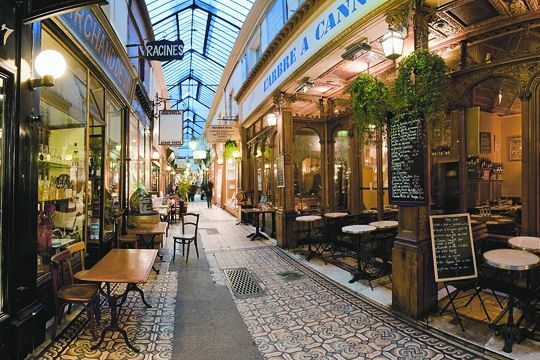 I woke up, put on the kettle and headed over to passage des perles. I adore the Tracy Reese skirt. So many options with that one skirt. I think if I got it, I would take it to a dressmaker and have it made in a couple of different fabrics, like paper thin wool or cashmere-It reminds me of a skirt I still have hanging in my closet. I have had it since 1980-and I never keep anything!! It is fitted about the hips and then the pleats just flow into the fabric. 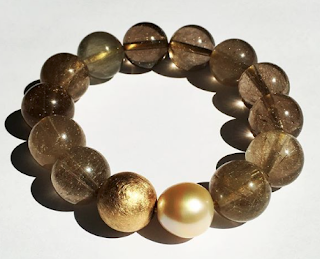 It can be worn casual or very dressed up. I have worn it with a vintage sweater and boots or with a t shirt and ballet flats from J. Crew. A turtle neck or an oversized sweater- I would definitely buy this skirt- as it is one of those things one can wear in so many ways. Have I said enough? :) Thanks! Anjela: Great idea to have it copied in other fabrics. More interesting than pants but not so obvious it would be 'oh that again'. Pants worn a lot get a galumphing wide shiny seat and skirts do not- why is this? Big MR store here,I go for sales. Great fabrics and coats (like Max Mara). Blouses, most sweaters cut too boxy for me. Found a fab fur-trimmed sweater jacket in the Paris store. Salesperson told me SportMax line is hipper and more fitted. Have not seen petites here but maybe they just don't carry them in Toronto. I love that skirt and the coat (altho' I can't wear yellow). The Rodriguez skirt I wanted was almost 600, and at that price, I'd be facing a really tough decision (thank goodness it wasn't in my size). I think skirts really repay the money spent for many years, even if styles change, as long as you really love them. The red brocade silk one I tried on at Any Direct Flight, for example, would have been classic-dramatic for years, sigh. . . I linked the Horyn article, "Tiptoeing into the Stores"- just click on it. ma, I think about that skirt too. You could have one made, the Chinese brocade, not hard to find, and the hem edging I think was just plain fuscia satin. At $600 I need a windfall, like a tax refund. I like that coat from Net-A-Porter. I don't mind spending a lot on an investment piece like that - the CPW gets so low that it makes it worthwhile. I'm afraid I would not buy any of those pieces in times of hardship. The skirt I would not buy at any time as I don't have legs like the model and the shape of it would do nothing for me whatsoever. I think real English classics are the only solution for 'longevity and value' to act as a backdrop for scarves and jewellery; not necessarily black, but probably plain colours. At the moment I'm seriously considering the investment of a Burberry trenchcoat. And I've recently invested in a heather green tweed Aquascutum blazer which I'm very excited about! I'm also very excited about teaming smart leather gloves with my autumn outfits to add an extra degree of smartness. That is a really inexpensive addition to a wardrobe. i learn to walk away first and then if i still want it then i will go back to buy the piece. however i have given up on i will wear/love it for a long time. it's not true. Savvy: Appreciate your comment and realize I have to have either that skirt or its clone. GP: "Real English classics" are a longevity-guarantee; however they do not provide the frisson I long for if cutting back on quantity... or is that an impossible wish? The reason I love real English classics is that I never tire of them, whereas the skirt you show is a specific style. To get the frisson you mention (and who could live without it?) I would pay attention to the details, eg. a turned up cuff or collar, coloured socks in bronze brogues or a felt fedora. I think it was Yves Saint Laurent who said something like all you need is a well made trenchcoat, a short black skirt, black trousers and a black sweater. What better canvas for your jewellery and scarves? GP: I don't gravitate toward English classics no matter what the economic climate. Trench coats look terrible on me. I admire them on others and keep thinking the right one will work. Duchesse - I love that yellow coat, but the side of my brain that gets nervous about money is saying, "You KNOW you are going to lean up against the car and put a big smear on that and the dry cleaning bill will be horrific." I tend to worry about maintenance costs with purchases a lot. Toby: Funny, I have four or five black coats and buy them happily in flush times. But as soon as I think about tightening my belt, I want more wit and colour. Why is this? And yes it would be prone living at the cleaner's. Love the gold color on the coat and bought one in velvet from J.Crew this season...I am thrilled with it and the color actually is flattering on me. I was worried about yellow! Karen: The J. Crew velvet Ecole jacket is getting tons of atention and for good reason. fresh. And your "honey glaze" colour is so lush in velvet- enjoy!